Here in the Southwest we can relate to an outdoor bus ad in Sydney, Australia. 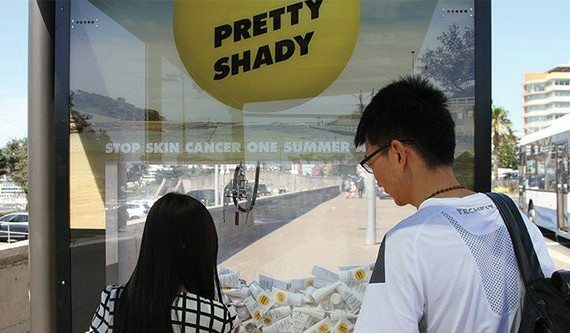 The Cancer Institute NSW’s ‘Pretty Shady’ campaign provided Sydney pedestrians with UV protection and shade in an effort to highlight the truth about the harsh Australian sun. Cancer Institute NSW, JCDecaux and UM created a custom-built SPF50+ sun screen dispensers on numerous bus shelter wraps. It also shaded commuters from damaging UV rays. It was a salute to old-school ‘lucky grab’ crane arcade game. The custom-built JCDecaux Citylights dispenser panel is operated by a mechanical claw. The dispenser mechanism is designed to engaging people with a serious sun safety message. Bus-shelter wraps which included custom roof panels, have been installed throughout the CBD and summer hot spots to provide Sydney commuters with shelter from harmful UV rays and help to raise awareness of the ‘Pretty Shady’ sun smart message and overall campaign aimed to stop skin cancer, one summer at a time. “Pretty Shady takes a fresh approach to raising awareness and encouraging sun protection in young people,” said Alecia Brooks, Portfolio Manager Skin Cancer Prevention, Cancer Institute NSW. “This installation is all about getting sunscreen into the hands of a generation who can work together to stop Skin Cancer one summer at a time,” continued Brooks. “Out-of-Home is now more than ever, an active medium that provides unique engagement opportunities that deliver real results,” said Alan Klein, Head of Creative Solutions, JCDecaux. “The Pretty Shady activity is the perfect example of how OOH can deliver a real value exchange by providing tangible benefits to those who engage or come into contact with the campaign,” continued Klein. Probably in competition with Arizona, Australia has the highest rate of skin cancer in the world but change can happen. We know that stopping sun damage stops 95% of melanomas, the deadliest form of skin cancer. If people share and engage in this message and act upon it, the next generation of young Aussies should be able to turn the tables. Here in Tucson, we’ve seen a dramatic reduction in skin cancer rates from bringing awareness to people.